Sent in by a visitor. 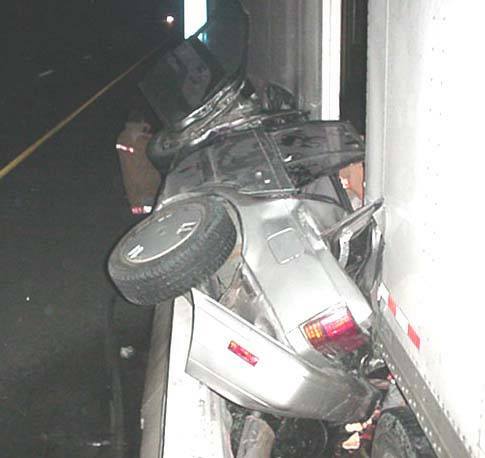 All three passengers in this truck were thrown from the vehicle about 300 to 400 feet before it came to rest. None were wearing seatbelts. They were so drunk they could not remember who was driving. 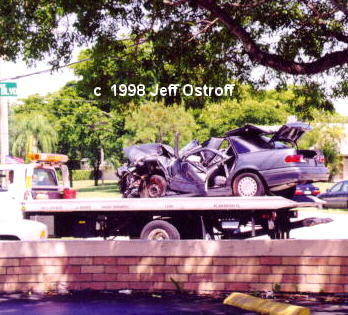 I Shot this wreck myself A nasty head on crash in front of the post office in Plantation, FL in 8/98. The guy lived, but had to be peeled out and air lifted! The right picture shows the other car. It was doing 60 MPH in a 35 MPH zone! Sent in by a police officer on 7/1/2001. Chevy truck driven by a drunk driver went completely through a utility pole	and then crashed into a shed on the side of Old Hickory Blvd. in Lakewood (Nashville), TN. 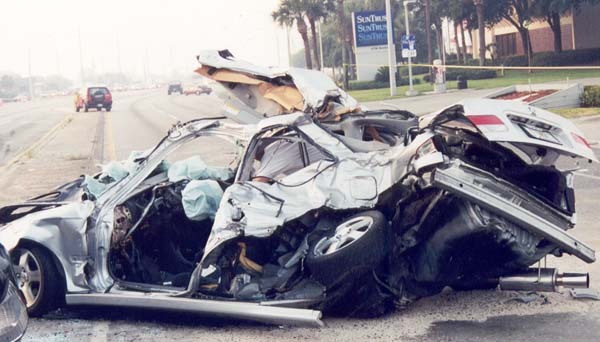 The driver was killed. Sent in by a police officer. 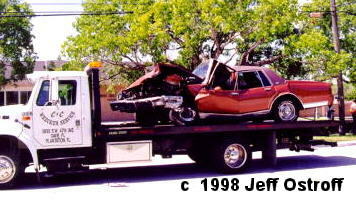 Chevy Spectrum hit by a car, pushed in front of a tandem trailer truck. The truck hit the Chevy and both struck the wall pinning the Chevy between the wall and the truck. 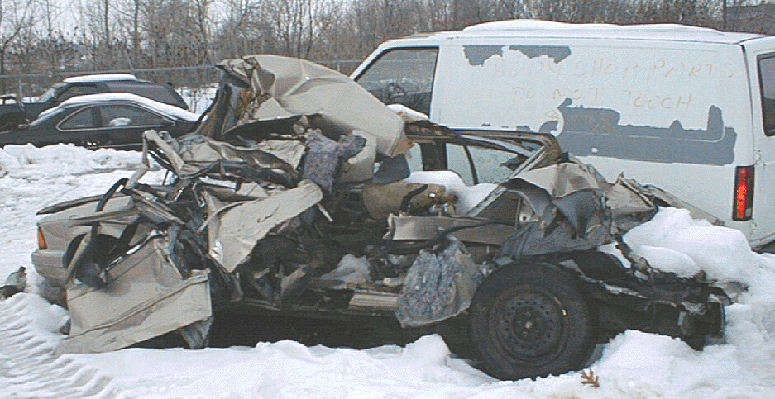 Driver survived, passenger died. Sent in by a visitor. He was rear ended by person doing 70+. Note the car came right off the frame. Sent in by a police officer. The driver of a Mazda MX-6 passed-out at the wheel due to a diabetic condition, ran off Nolensville Rd in Nashville into ditch. 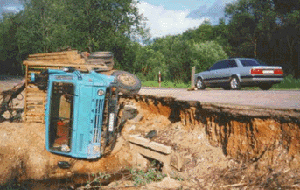 It took out trees and rolled back in the road. Sent in by a visitor. 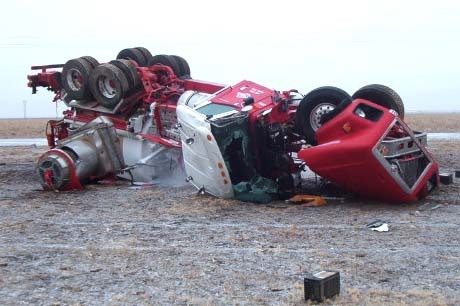 This is what happens when you cross a $750,000 liquid nitrogen truck with black ice. 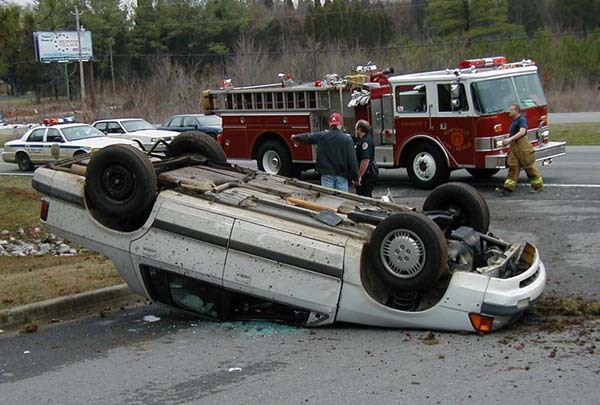 The driver walked away! Sent in by an ex coworker. Driver crossed median, lost control. When we got her out, she grabbed a beer, makeup case, cell phone and walked down the street. The police caught her in a parking lot trying to run from them. DUI. Sent in by a visitor. 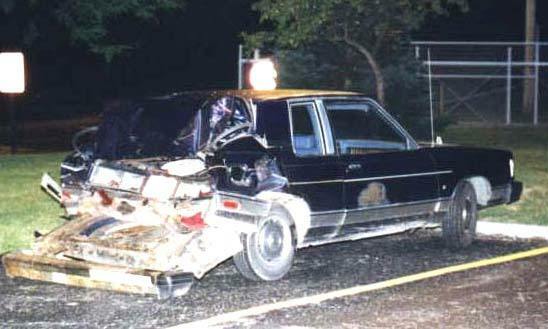 A shot of his car that was in an accident back in Aug. of 1996. Sent in by a police officer in November 2000. Battery Lane in Nashville, TN. 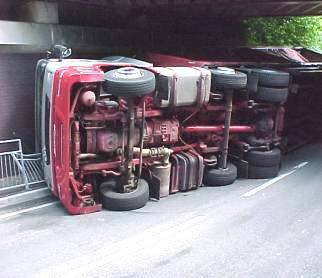 Do not adjust your set, it's the truck that's upside down! Sent in by a police officer on 7/15/2001. 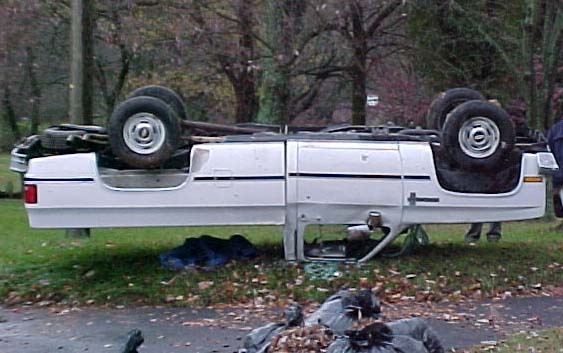 Wreck in Nashville, DUI. Sent in by a visitor. Don't know where this happened. In front of the Galleria Ft. Lauderdale, 1995. Sent in by a visitor. 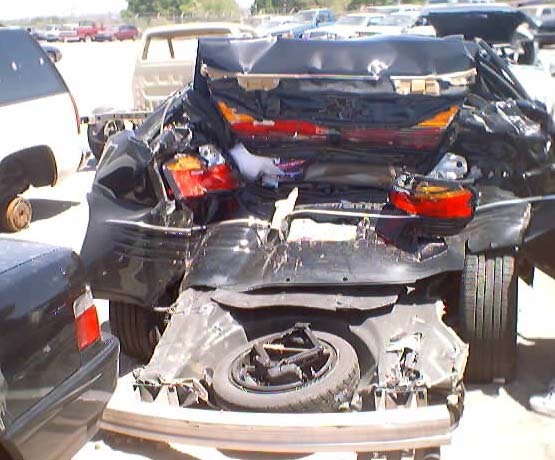 A totaled Mercedes E Class. 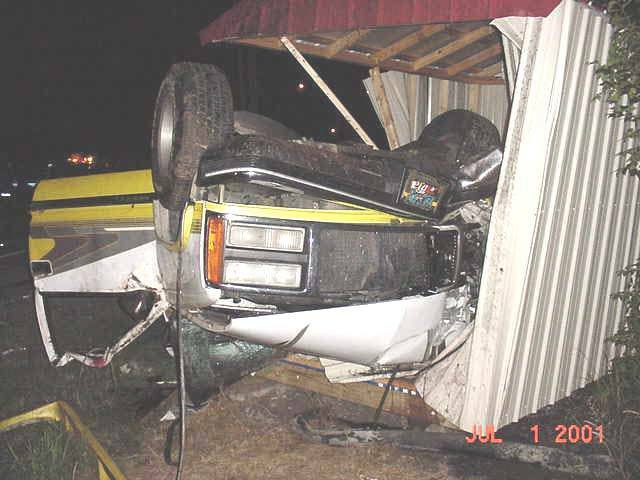 Sent in by a visitor 12/18/2001, white truck hit the blue truck. Now you know which truck to buy. Sent in by a visitor's kid sneaked his parents' car out, got in a minor wreck, fled the scene, lost control, crossed oncoming lanes, hit a curb/gutter and then hit a tree and spun back into the road. 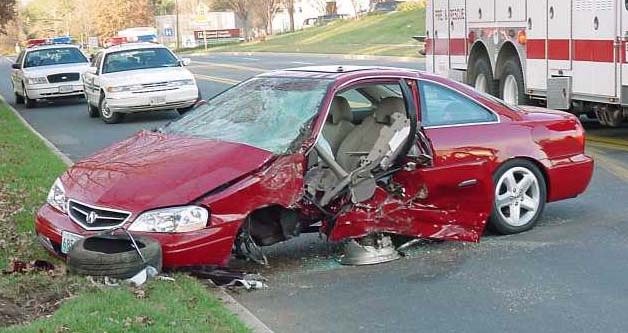 He suffered only leg injuries. Sent in by a police officer from Central Florida. 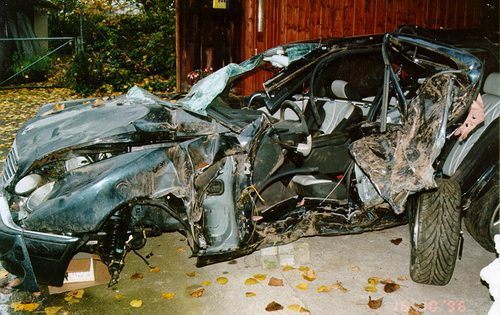 This was the end result of a street race on a major highway. Sent in by a visitor. 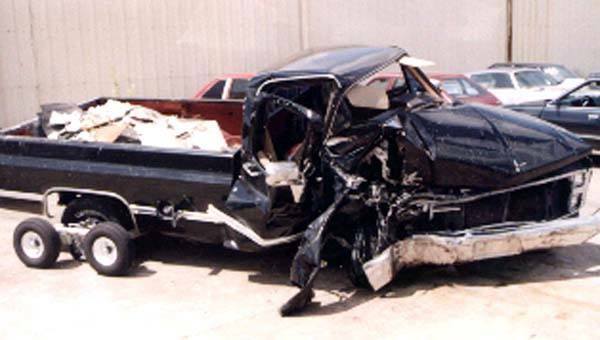 This happened to his dad June, 2001. Sent in by a visitor. Chrysler Spirit. Half a double-wide home being towed ran over it while it was parked on the side of the road on I-69 near Ft. Wayne, Indiana. Sent in by a police officer. 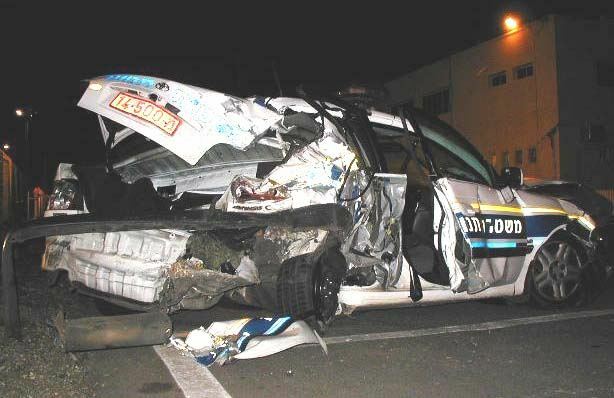 From an officer in Israel, a drunk slammed into his squad car. Sent in by a visitor. 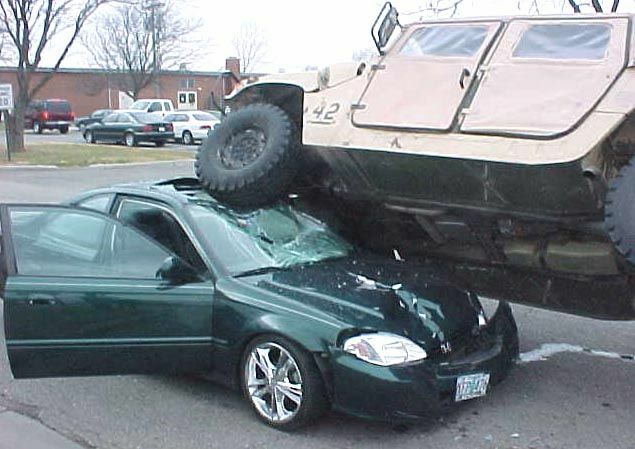 A military Hummer vehicle drove right over this Honda! Unfortunately, the Hummer missed Osama, who was following in the Yugo behind the Honda and got away. Sent in by a visitor. 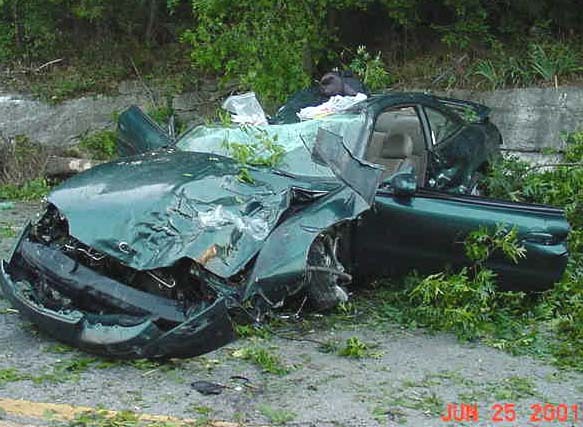 An 18 year old girl was driving drunk when she hit a car, went airborne 45 feet before hitting a van knocking the front end up on a 2 foot high brick retaining wall. 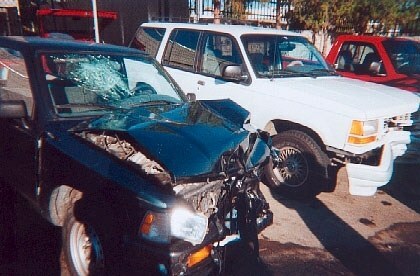 Both cars totaled. Sent in by a visitor. No explanation necessary. 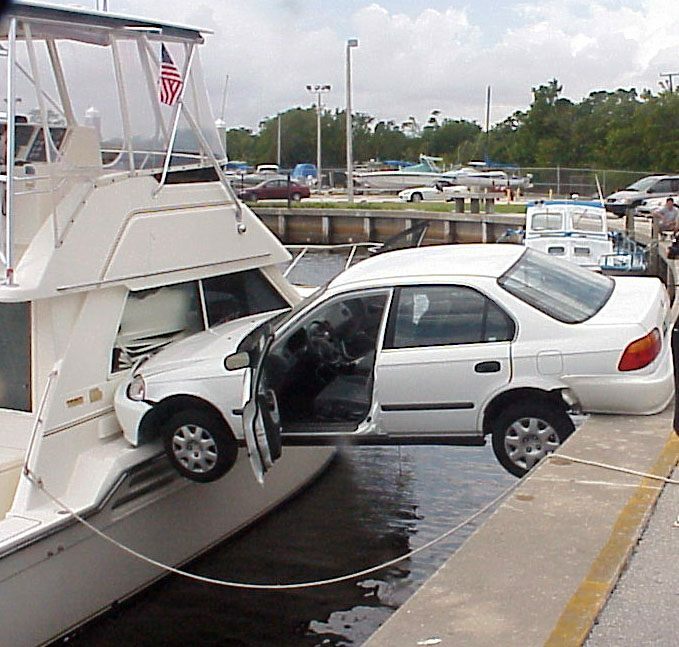 Alright, women drivers! A guy was teaching his daughter how to drive. 'Nuff said. Sent in by a visitor. He got this picture via email. 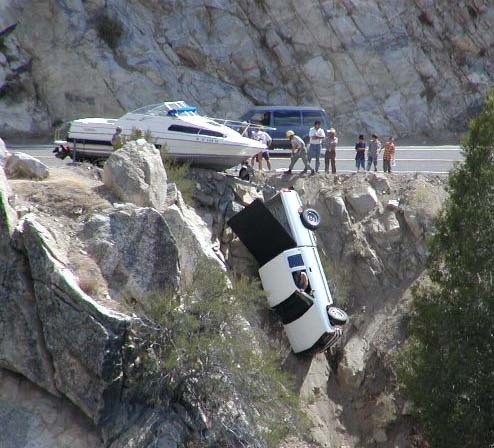 If you look close you can still see people in the truck. Sent in by a visitor. Photo taken summer 2001, in Toronto, Canada. 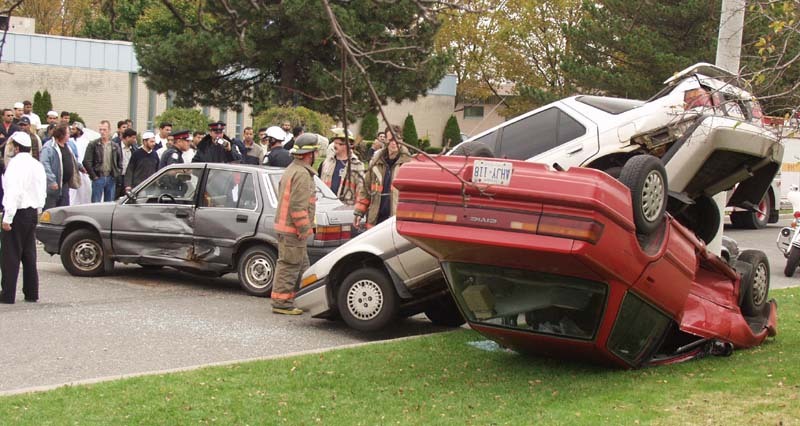 Two cars making love to each other. Ouch! Sent in by a visitor. 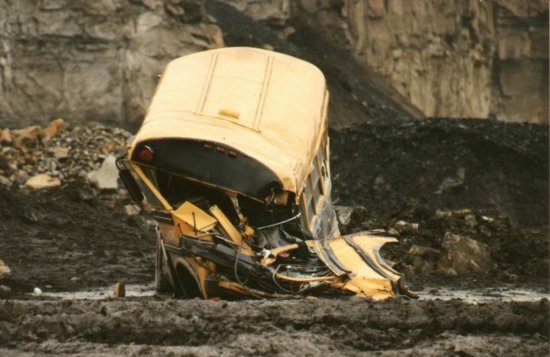 This is a school bus used to take workers into the strip pit. It got backed over by a Titan dump truck, luckily no one was in it. Sent in by a visitor. Ouch! 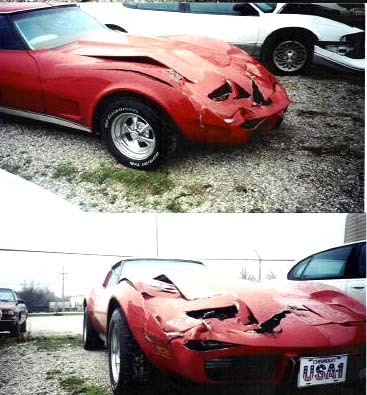 A wrecked '77 Corvette. Moron in a pickup truck turned without looking. Sent in by a visitor on 05/04/02. 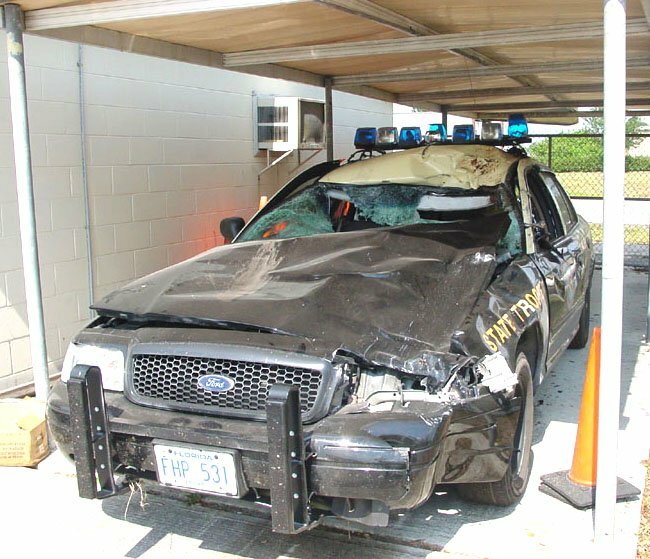 Florida State Trooper was going home and hit a cow at 65MPH in the fog. He suffered only minor cuts from the glass. 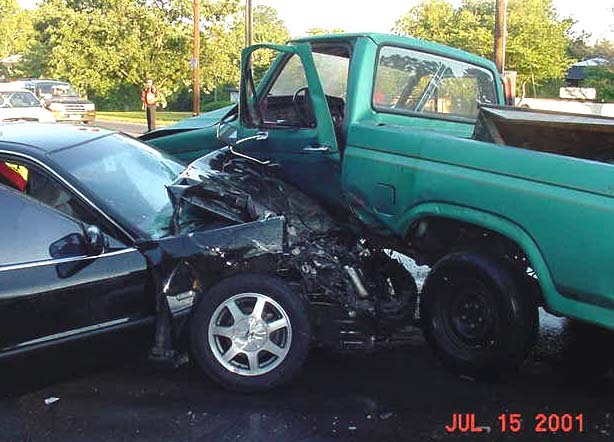 The 2001 Ford is not repairable.